Over a weekend in 2003, in a lushly modern Martha’s Vineyard summer home, six people need to untangle the web of race and class and family. Watching them do it in the Ensemble Theatre’s production of Stick Fly (through May 2) is a richly voyeuristic, thought-provoking experience. Kent LeVay, an aspiring writer, is the younger son of the “Martha’s Vineyard LeVays,” a rich African-American family that traces its lineage back to the first black family to own land on the Vineyard, known even today for its status as a playground of the rich and famous – and mostly white. Taylor, his fiancé, is the illegitimate daughter of a famous professor and writer whose works include titles such as “Legacy of Rage” and “From the Middle Passage to the Inner City.” He meets her at her famous father’s funeral in 2002 (he’s a fan); a year later, he’s bringing her to the family vineyard home to meet his parents and brother. Flip, Kent’s brother, is a plastic surgeon. And something of a cross between a womanizer and a commitment-phobe. At the moment, he’s dating Kimber, a white inner-city school teacher. They’re both getting off on being an interracial couple, thinking they are above the societal prejudices they endure when they see people looking at them with suspicion and barely concealed disapproval. As if all that weren’t enough, there’s Dad, a neurosurgeon and veracious reader, and Cheryl, the daughter of the family housekeeper, who this weekend is filling in as the family helpmeet because her mom is sick. And each of them brings a whole new string of baggage to the table. Across two hours, their drama unfolds and peels back endlessly thoughtful layers about what it means to be successful, what love is, why family matters, the subtle lines in the sand of class and status. It’s your college sociology class with much better lighting. And it hits the marks on any number of levels. Playwright Lydia Diamond, a Waco native, writes with snappy dialogue that’s often funny and smart. Thoughtfully directed by Eileen J. Morris, a protogee of Ensemble founder George Hawkins, this is a play that is much less about black and white, and much more about who we think we are. The acting is strong, if sometimes uneven. Kendrick Brown plays Kent with an easy grace and charm, never veering into overdone angst about his strained relationship with his father, never once playing the clichéd “tortured writer.” He moves through the role and across the stage with almost feline finesse in a pitch-perfect performance. Wayne DeHart grumbles and flirts and charms as Dad. He’s one of those actors who brings meaning to each motion, from something as simple as setting down a glass or even just lifting a finger. He plays a character who isn’t given much sympathy – but DeHart’s performance brings forth a completely believable humanity. Estella Henderson has the tricky role of the trying-too-hard Taylor. She’s tried too hard to succeed in school. She’s trying too hard to be liked by the LeVays. Henderson mostly manages to make this seem natural and not cloying, and she’s got a gift for comic timing that’s delightful. Her counterpart, the other girlfriend of the weekend, Rachel Logue’s Kimber, isn’t trying too hard at much of anything. Except to overcome her own white-as-oppressor past. Logue offers a performance that’s equal parts sass and insight. 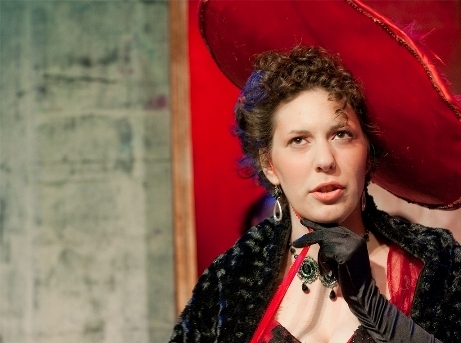 One of the best performances of the evening belongs to Florence Garvey in her Ensemble debut as Cheryl. For sure, she has the best monologue, in Act Two, about the obliviousness of the LeVays and the simple, cutting slights of society, and she delivers it in bravura style. And her comment, to Taylor, about how she’s had a room with the LeVays her at the Vineyard or in Aspen, about how “I’m not trying to find myself. This is my home,” is the most believable of the night. The cast gets tripped up in the academic verbiage, though. Diamond’s written it a la the smartness of Aaron Sorkin, sprinkled with the kind of quick intelligent insider-terms you’d hear from a CSI franchise. It’s rapid fire, and it’s heady stuff: Weber’s theory of social dominance, the savage inequities of a broken educational system, the intricate vocabulary of entomology. These are words that are natural to these characters, that flow into easily into conversations that become debates that become means for insight. But they never quite sound natural from this cast, which has clearly mastered the words, without necessarily capturing the essence. Yet Stick Fly more than delivers on so many other levels. The set is a soaring modern thing, and it’s easy to imagine that designer Winifred Sowell took into account the idea of this family renovating a 200-year-old weekend cottage. The massive window in the living room looks out against a blue sky, evoking the idea that th4e home sits on a bluff above the sea. Every inch of the stage is used, and the back porch set is particularly cozy and well-decorated. Sound designer Adrian Washington uses R&B-imbued instrumental riffs between scenes, and their elegance becomes one more telling characteristic of the LeVay clan. Morris is at the top of her game in her direction here. Her steady hand and her commitment to stagecraft as telling the legacy of a people is spot-on. She moves her actors around the stage and into their own heads with a brilliant thoughtfulness. While every show at the Ensemble is one that celebrates the writing and art of African-American theatre, they are also always about us as a society. They force us to think about race and class, about social justice and evolving philosophies. 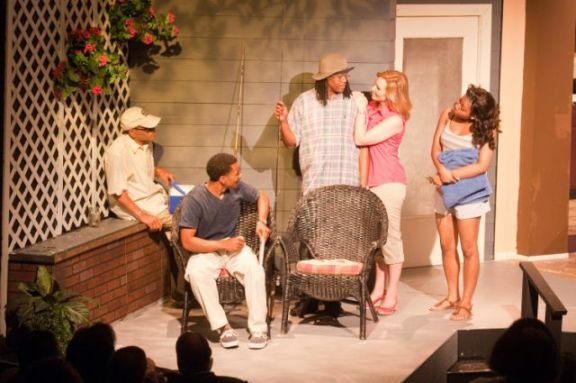 With its wit and poignancy, Stick Fly is both a tremendous addition to the African-American playwriting canon and a stunning evening at the Ensemble. Grand opera unfolds at its best with HGO’s Queen of Spades (through May 1 at the Wortham Center). Tchaikovsky’s intricate retelling of Pushkin’s story of obsession and deceit is dark and driving, brooding, seductive, sublime. It’s the story of the tormented Russian gambler Hermann, pursuing riches to woo the heart of the lovely Lisa, betrothed to Price Yeletsky. His obsession leads him to Lisa’s grandmother, the Countess, who possesses the secret of which three cards guarantee a winning hand. Across a sweeping psychological drama emerges a music so rich and layered, it jerks the audience along to the final, inevitable conclusion. Russian tenor Vladimir Galouzine sings Hermann with tenacity, his voice luminous with Hermann’s increasing pain and obsession. 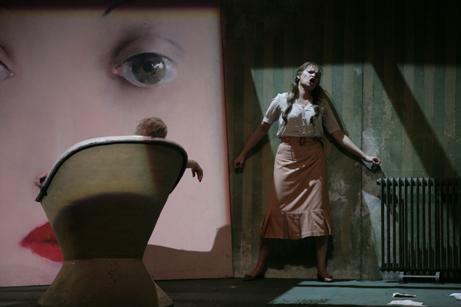 Russian soprano Tatiana Monogarova brings clear, emotional tones to her role debut as Lisa. Judith Frost, the mezzo-soprano recently seen on HGO’s stage as Mrs. Grose in “The Turn of the Screw” is mesmerizing in her portrayal of the Countess, her voice rich and deep, her performance captivating. Carlo Rizzi conducts with power and grace. And John Macfarlane’s sets and costumes add superlative, starkly rendered touches, evoking a grey Russian existence. The added incorporation of puppets from Green Ginger puppeteers gives a surreal touch to the story. Queen of Spades is big and bold, a absolute maelstrom of music and tragedy. Plunging as it does into the depths of the human soul and its capacity to single-mindedly chase after what it wants to the detriment of all around it, this is opera to leave you breathless. Through nearly half of its running time, this Alley production of Mary Chase’s best-known play feels like a warm, largely effortless TV sitcom from anywhere between the 1950s and today – though considering the innocence of this material, I’d be more tempted to guess the former than the latter. And a good half of that is spent remembering the forever-affable Jimmy Stewart chatting happily with a 6-foot-tall invisible white rabbit who gave the resulting film its title and its primary comic effect. In true sitcom style, eccentric but lovable characters race in and out of the room, flustered and flabbergasted, mugging and gawking as though there were a camera right there for all the close-ups. You sit in the live audience at the Alley half-remembering which sitcom had this character or that one, and even what your favorite episode might have been. But then, something happens. In Harvey, there’s no naming of what happens, indeed no mention that anything happens at all. But as acts 2 and 3 roll around, the sense increases that something dark and sinister is scratching at the windows and doors, trying to get at the affection and innocence within. Whatever is outside hates what’s inside – these rounded edges of remembered light, the quirky misunderstandings that family members have, the way it all looks so wonderful in memory or in scratchy eight-millimeter home movies. I’m guessing that something was World War II. Otherwise, it’s hard to imagine why this amusing evening of gathered eccentricities picked up a Pulitzer Prize. Today, we don’t have a global war tearing at our innocence and ripping apart our isolation every day in the morning paper. 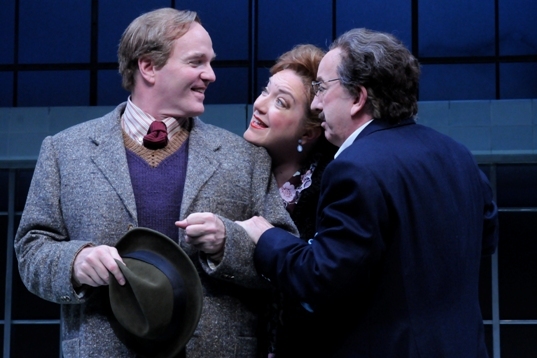 Today, in fact, we have neither innocence nor isolation, so there’s something deliciously quaint, something wistful about watching a production of Harvey at all. Not only do these characters never leave the country to go kill anybody, they barely seem to leave their neighborhood. For Elwood P. Dowd and his invisible best friend, there are more than enough bars to visit within walking distance. The production is nothing short of luminous, with sets by Hugh Landwehr, period costumes (vaguely 1930s) by Judith Dolan and lighting by Pat Collins. If anything, the warm, rich colors of the Dowd home – a kind of library, of course, with other places for people to run through various doors – is contrasted with the sterile white of the sanitorium in which Elwood seems ever about to be committed, analyzed, drugged and “cured” of the very things that make him worthy of our love. I don’t imagine psychiatry and its enforcers are the villains here, though: this isn’t One Flew Over the Cuckoo’s Nest. The villain, to a large degree, is the world that gave us psychiatry (and World War II), taking away so much that was golden about America as part of the exchange. Few actors within 1,000 miles seemed less likely to be right as Elwood P. Dowd than the Alley’s James Black. Nearly every character he plays here is too smart, too cynical and definitely too acerbic to be anyone ever associated on film with Jimmy Stewart. Indeed, Black has handled the Jack Nicholson role in Cuckoo’s Nest to considerable effect. In Harvey, though, he works hard to soften his razor’s edge of a voice and even lets vocal notes crack from time to time, taking on an innocent grin for the world that endears unexpectedly. The transformation is close to remarkable, one of those things an actor has to pull off from time to time in a resident company when audiences remember the characters you’ve played before. Black is a revelation, proving that it’s possible to become Elwood without becoming Jimmy. Kristine Nielsen as Elwood’s ever-put-upon, ever-flustered and presumably ever-widowed sister Veta Louise is the most-sitcom of all the characters, the kind of puffed-up, socially ambitious, shallow-but-ultimately-redeemable sort we’ve seen play aunts, mothers-in-law, sorority housemothers and even maids on TV for generations. And what can we say: Nielsen has watched the reruns on Nick at Nite and transmuted them into something marvelous. The same can be said of James Belcher as the family lawyer invariably called “Judge” and Elizabeth Bunch as Veta’s constantly hysterical daughter Myrtle Mae, whom she’d very much like to marry into money. Moving out of the Dowd library to Chumley’s Rest – whose stark white set pieces roll onstage beautifully, unstoppable as modernity itself – the cast is equally adept. John Tyson is marvelous as Dr. Chumbley, a mixture of good and evil (even a little sympathetic when he starts seeing Harvey too) until he takes to walking around with the huge, truly frightening syringe that will cure Elwood of all his delusions. Mark Shanahan and Emily Neves are terrific as his assisting doctor and nurse. And though the role is tiny and arrives very late in the play, we can’t forget Todd Waite as cab driver E.J. Lofgren. In his briefest description of what patients are like when he drives them out to Chumley’s Rest – and what they’re like when he drives them home after being repaired – Mary Chase earns her Pulitzer. Photos by Jann Whaley: (top) Black, Nielsen and Tyson; (bottom) Neves and Shanahan. We are facing a serious shortage of rhymed couplets these days. Happily, the French playwright Moliere, with a gutsy assist from Houston’s own Classical Theatre Company, is here to help us out with that. The troupe that bills itself as CTC (having learned from River Oaks Chamber Orchestra and others the value of “Have Acronym, Will Travel”) says its mission is to give a fresh look at plays a century old or more. Moliere’s Tartuffe (first performed in 1664) is considerably older than that, but it plays almost as though it were penned yesterday. Almost – and that’s where those pesky couplets come in. With the exception of the Hispanic rap that carries much of the narrative for In the Heights, currently at the Hobby Center, we can’t think of another show that does quite this much in paired lines. 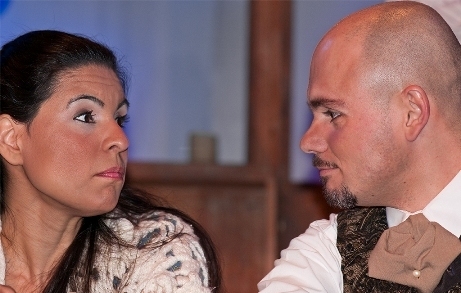 And just when you think you’ve got the rhythm down, when you’re practically tapping your feet to the words, Moliere throws in a back-and-forth piece of hilarious dialogue in which two people rhyme each other. At its best, the effect is delicious. 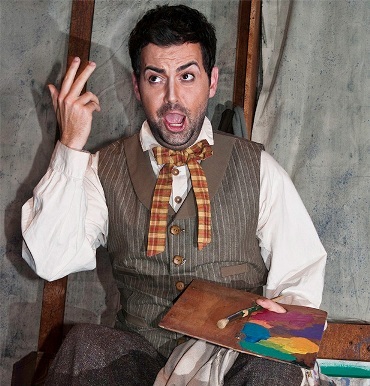 And the rhymes themselves, based on translations from the French by Maya Slater and the great Richard Wilbur as adapted by CTC’s executive artistic director John Johnston, are light years ahead of the simplistic street prattle in Heights. Johnston’s contributions to Tartuffe tend to be obvious: a one-line reference to “Stanford Financial,” for instance, or the redneck Texas deputy who turns up near the end to serve eviction papers. Mostly, though, everyone involved in the production keeps a tight focus on current events – or, at least, keeps making a plus-ca-change statement about human greed and gullibility. While Allen Stanford, Bernie Madoff and others are suggested by Tartuffe’s shenanigans to get other people’s money, the real target here is religious hypocrisy. When Tartuffe, a preacher (even if presumably Catholic) feigns to break down and beg forgiveness, he addresses the audience straight-on with tears flowing from the anguished eyes at the center of his oh-so-contorted face. It’s Jimmy Swaggart all over again (remember him? ), delivering his famous confession not in the traditional Catholic confessional but on TV (remember that?). Johnston, who clearly knows and loves this material, directs with a steady hand, drawing major energy levels and countless laughs from his first-rate cast. 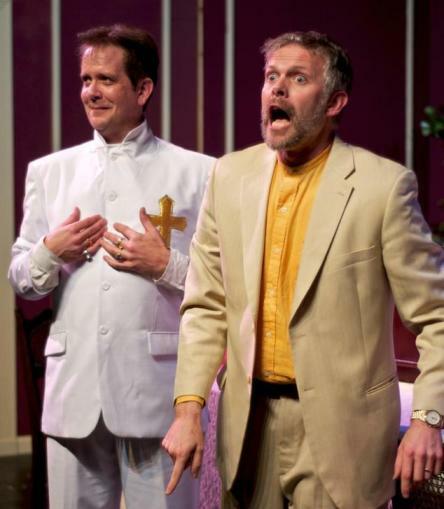 Thomas Prior and Gregory Wise shine as the play’s matched pair, slimy preacher Tartuffe and Orgon, the wealthy fool he takes advantage of while trying to bed the man’s wife. Pamela Vogel is wonderful as that wife, Elmire, and she’s given some terrific, weary wisdom about a woman making her way through a world of lusting men. If anything, the younger generation gets even wilder theatrics: Blair Knowles as Orgon’s often-hysterical daughter Marianne plus Philip Hayes as Valere, the guy she wants to marry, with Caleb George drawing on a just-buried punk weirdness worthy of Rocky Horror to depict the rich man’s confused son, Damis. And, once you see CTC’s Tartuffe, you’ll understand that the whole thing wouldn’t work without what may be the origin of the wiseass maid in so many decades of TV sitcoms. Holly Haire is a delight as Dorine the know-it-all domestic. And yes, she speaks in rhymed couplets too. In 1996, I spent 14 glorious months living and working in New York City. Every Saturday, I walked the six blocks from Astoria Blvd up to the Ditmars El stop, and began my day with feta cheese-filled filo pastry and the darkest, richest coffee I’ve ever enjoyed from a little Greek bakery packed with loud, welcoming Greeks, talking animatedly with their hands, sitting in a space where faded pictures of white buildings on rocky islands in the middle of azure seas hung on the walls. Following coffee, I proceeded down the blocks: to the fish market, to the butcher, to the fruit stalls outside the bodega, to the Blockbuster for the weekend’s movies, and finally, back to my own corner, where I collected the laundry from the wash-dry-fold spot. It was the best 14 months of my life. And, two of the best hours of my theater life were spent on Tuesday night at the Hobby Center, where the national tour of In the Heights swept into town, with a flair of fresh salsa rhythms and cheery vignettes of life on a block in upper Manhattan’s Washington Heights. Here, amid the grittiness of barrio life and steadily creeping threats of development and gentrification, are a cast of characters that are by turns very real and every cliché. Wrapped up in the pulsing score that blends infusions of hip-hop and rap with hot Latin spice are the stories of what it means to be an American (or a Puerto Rican, a Dominican or a Cuban, as it happens), what happens when dreams and desires meet reality – and what it means to be home. Composer and lyricist Lin-Manuel Miranda’s score drives this vehicle, which is hardly the first musical love letter to a piece of New York (On the Town, anyone?) and it’s definitely not the first to look at Latinos in New York (Can you say West Side Story). But his incorporation of rap and hip-hop and other neighborhood sounds tells the story where it lives. Quiara Alegría Hudes’ book is a weak point – you’ll be hard-pressed not to see the plot points coming from miles away – but, its heart is so sincere, you really won’t mind. At its core, In the Heights is about the people of this nondescript block: Usnavi, who owns the corner bodega, where he serves up café con leche with just a touch of sweetness and cinnamon (and played with charming energy by Kyle Beltran); his younger cousin Sonny who, even as he longs for change, recognizes that this neighborhood is his center; Nina, the neighborhood’s golden girl who got a scholarship to Stanford; her parents Camila and Kevin, who run the car company opposite the bodega; Benny, their star employee with the hots for Nina; Abuela Claudia, the wise grandma/sage of the block; the gals at the salon. They come in and out Usnavi’s bodega, buying coffee and the lottery tickets that will power this story. You’ve seen these characters before. Miranda himself noted that he borrowed themes from almost every musical he ever saw, including Fiddler on the Roof, West Side Story and Rent. You just haven’t really seen them like this. Beltran’s Usnavi is torn between his desire to get away and drink margaritas on a beach and running the bodega as a legacy to his parents. His emotional grounding force is his relationship with Abuela Claudia, who practically raised him after his parents died, and he pines for Vanessa, the salon girl whose main goal in life is to rent a flat in a more stylish neighborhood. Kevin and Camila want the best for Nina, even if it means sacrificing absolutely everything. Daniela, the salon owner, is moving her shop up to the Bronx, where she got a better rent deal; she’s happy to take her staff with her and pledges support for Vanessa’s dreams, but is equally emphatic about not supporting Vanessa’ mother’s self-destructive ways. This is a show about people who can’t pay their bills, who struggle to hold on to what little they have, who look with longing for the next big thing and finally realize there’s no place like home – no matter where they wind up. As a production, it has holes galore – see the aforementioned weak book. Ditto music and dance numbers that have a tendency to look and sound the same. Yet it still manages to be utterly gratifying. Beltran story drives the bus of this production and his freeflowing rap riffs are pitch perfect. Arielle Jacobs pours her angst and worry into Act I’s “Breathe,” a pop musical ballad that’s part “Reflections” out of Disney’s Mulan and part American Idol styling; but her raw talent is inescapable. As her character grows into her own self-awareness, Jacobs is entirely believable in the role. Shaun Taylor-Corbett shines as Sonny, Usnavi’s “underage, underpaid cousin of the workforce,” who manages to do things like fix a fridge, set up Usnavi on a date with Vanessa, and create a slushy that’s part blue raspberry, part cola and Nerds thrown in on the end. 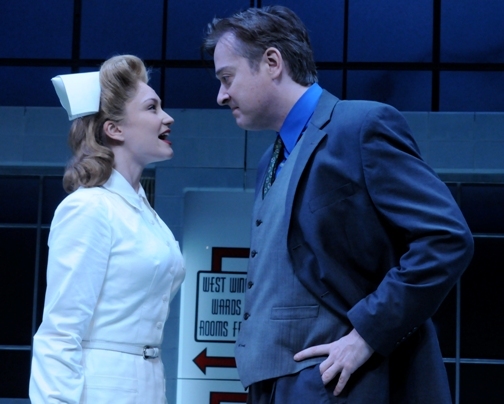 He’s a cute punk with a rapid-fire dialogue and Taylor-Corbett’s having a blast on stage. Isabel Santiago, as Daniela, is brassy and fun, whether spewing forth harmless gossip or touting the virtues of hair gel. 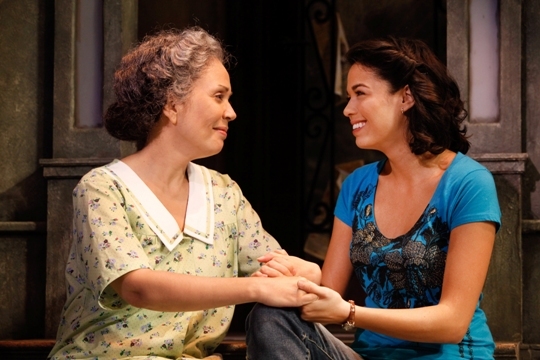 Elsie Santora’s Abuela Claudia is heartfelt and, ultimately, heroic. Her rendition of “Paciencia y Fe” is a gorgeous epistle of what both those qualities actually mean. And David Baida’s Piragua Guy is just a joy, both for his simple pleasure of owning his own piragua pushcart, and his ultimate triumph over Mr. Softee. Anna Louizos set is a cross between Sesame Street’s famous streetscape and a living tableau. If it’s almost too warm and fuzzy to be believable as a barrio block, who cares? It perfectly echoes the sheer warmth this show generates from start to finish. 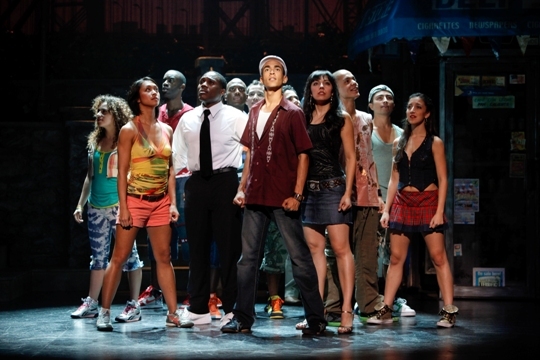 You’ve seen In the Heights before, hundreds of times, across hundreds of musicals and operas. You won’t find new characters here. What you will find, and what the future of musical theatre so badly needs, are new voices, using new ways of combining song and dance that echo their own lives. What powers In the Heights and makes it such a pleasure is that Lin-Manuel Miranda actually has something to say, something that isn’t about what a horrible lot in life this immigrant community has, but something sincere and relevant about hope and home. Photos by Joan Marcus: (top) Elise Santora and Arielle Jacobs; (bottom) full company. It is a shame that, even after adding two performances, Opera in the Heights can’t locate so much as a single empty seat to its production of Puccini’s La Boheme. Since OH’s Lambert Hall used to be a church, maybe they should create a “cry room” (how appropriate! ), at $12 per folding chair. It’s a shame because this might be the finest version of anything that Houston’s small “stars of tomorrow” company has ever done. Of course it’s a sellout, you might say. 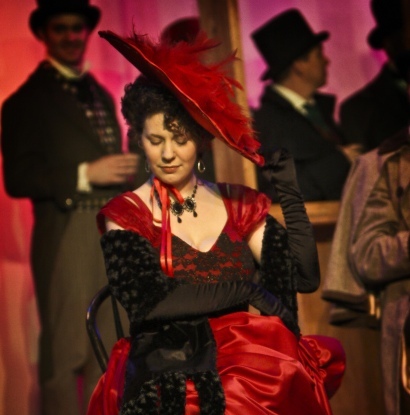 La Boheme, as OH artistic director William Weibel and many other experts have pointed out, is the perfect starter opera. It’s brief, it’s intense, it’s gorgeous to listen to and it’s affecting to watch. I should know, since it was my starter opera. I’ve suffered through almost numberless (and long) evenings of stupid plots, shallow characters and unmemorable music after being suckered in by La Boheme. Yet what I’m saying about the success of this production has little or nothing to do with all that. The two stars this time out are not even the singing actors who play Rodolfo and Mimi, but Weibel himself and masterful stage director Brian Byrnes. There’s something life-changing about hearing Weibel carefully, lovingly conduct and his small, efficient OH orchestra perform an oh-so-familiar score. As when you listen to a remix of a Beatles classic, there’s suddenly a tambourine you never heard before, suddenly an unexpected flourish of strings. If Weibel doesn’t love Puccini’s music to distraction, he’s the greatest actor of all time. And the process is helped along by the hall’s impressive acoustics. This intimate music, like the intimate story is conveys, make the perfect expression of what OH is all about. For his part, Brynes is best known for staging every decent fight sequence on any stage within about 150 miles, as well as for being a theater professor at U of H. He directs La Boheme as though he’s never heard the story before, as though he’s never heard of the story. Things often treated as familiar and tired are lived anew, fresh and quirky and real. In particular (quite sensitively for a stage director), he embraces the miniscule accents in Puccini’s score and always gives an actor something to do to the music. Few directing their 17th Boheme, or seeing their 1,246th, would even bother. There are dozens of moments that surprise and delight, which surely is exactly what Puccini had in mind. Brynes and his helpers (including the talented Clinton Hopper, late of NOVA Arts), also dive in and fix what’s typically “wrong” with an OH opera – namely, the set and costumes. This Boheme set sidesteps the usually heavy-wood-covered-in-paint that forever links any production to high school theater, preferring a lighter, more contemporary and more versatile apparatus made of frames and see-through screens. Watching the familiar Parisian garret morph into Café Momus on Christmas Eve is by itself worth the price of a ticket. We hope Byrnes has found a regular gig as a director for OH. 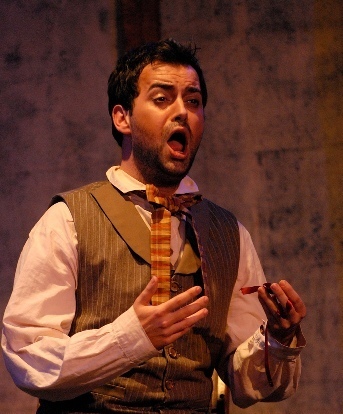 His flair for theater is needed here, to let the voices do what voices do best. The so-called Emerald Cast (alternating leads belong to the Ruby Cast) gives off the appropriate amount of youth, poverty, playfulness and sarcasm, mixed with some lush singing of some of opera’s lushest melodies. David Guzman and Daniella Carvalho make splendid work of Act I’s bookended greatest hits, “Che gelida manina” and “Mi chiamano Mimi,” and then are powerful and entirely believable as doomed lovers the rest of the night. If you wanted to miss a lot, you could spend an entire pleasurable evening watching what Carvalho does with her hands. They must be borrowed from a ballerina. Charles Stanton makes an incredibly likable Marcello, and actually finds an endearing comic fluster over Musetta’s infidelities that I’ve never seen before. And Alyssa Bowlby, who wowed us some time back as Nanetta in Verdi’s Falstaff, hits Act II’s humfest known as “Musetta’s Waltz” (“Quando men vo”) right out of the park. Filling out the four main bohemians, Keir Murray shines as Schaunard, as does Nathan Resika as Colline. The latter’s farewell to his beloved overcoat near the end, “Vecchia zimarra,” is an understated scene-stealing delight. The OH chorus does its usual impressive singing, with at long last a stage director who gives them something to do. The fact that last night this almost invariably involved moving up and down the aisle past my left shoulder didn’t detract in the slightest.